NEW! Second edition covering the IMPACT Act, Changes to RUGS including the new PDPM and documenting the distinct value of OT! Occupational therapy within a skilled nursing facility (SNF) can be a varied and challenging experience. Clients no longer receive all of their rehabilitation in the inpatient setting and are discharged to post-acute care SNFs to complete their rehabilitation process. In addition, recent changes in payment for clients within this setting require occupational therapy practitioners to have knowledge of coding and billing practice and acceptable modes of intervention. Client discharge from a SNF back to the community is an ever-increasing expectation with shorter lengths of stays and higher patient expectations for quality outcomes. 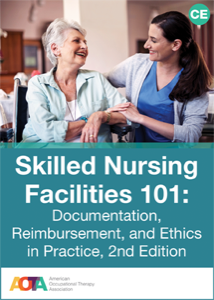 This courses is designed to help practitioners better manage practice within SNF settings for inpatients (Medicare Part A) and outpatients (Medicare Part B), this fully updated course addresses the importance of documentation, requirements for different payers, significance of managing productivity, understanding billing considerations, and maintaining ethical practice standards. • Identify regulatory changes related to rehabilitation services and how they will affect practice, the management of therapy time, and clinical strategies. • Identify and differentiate the parameters for productivity and delivery of occupational therapy services. • Recognize the importance of accurate, concise documentation to support the medical necessity of rehabilitation services. • Identify reimbursement sources related to therapy and long-term care. • Recognize how regulations and ethical guidelines are applied professionally to benefit patients.